report that with a multiple osteoarthritis code. The times that you would break into the specific joint and laterality would be when you’re trying to prove or substantiate medical necessity for certain things, like if you were evaluating a patient or planning to do a hip replacement on that same patient, they may have osteoarthritis and all these different joints but you’re focused on the hip joint, specifically the left hip joint. So, your claim should have the specific code to say, “Specifically we’re dealing with osteoarthritis of the left hip,” then you could add additional codes, say “they also have it here, here, and here,” but for our purposes we want that specificity. That’s really the only time that she usually going to come into play, it all comes down to payment, unfortunately. Laureen: Is this the guideline? Alicia: M15 – M19 are the codes that we’re looking at, that’s it. Chandra: Yeah. Usually there’s a multiple sites option, for categories where there’s no multiple site, code should be used to indicate the different sites involved. Alicia: M15.3 secondary multiple arthritis? Chandra: That’s secondary. When you’re talking M15, remember secondary is the result of something else. These are more than likely, I think they’re M19s if I remember correctly. Laureen: I just wanted to share this is how you can be your own consultant and basically answer your own questions. Not that we don’t love doing it, but this is what I typed in as they were talking “ICD-10 guidelines site and laterality” boom! It brought me right here, I opened it up. I typed in “site and laterality” and it brought me right to it. Google is your friend, double check it, but when you have questions like that, that’s how we start all of these questions and then we try double check each other. 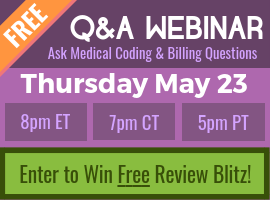 How To Pass The ICD 10 Exam in 2016? 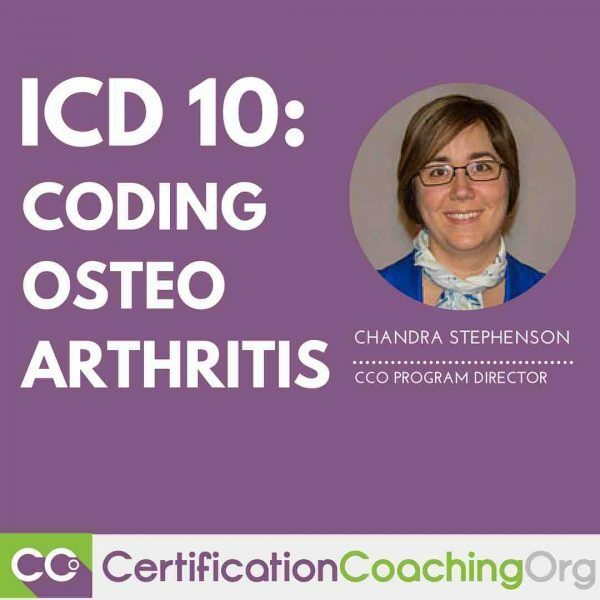 Chandra Stephenson, CPC, CIC, COC, CPB, CPCO, CPMA, CPPM, CRC, CPC-I, CCS, CANPC, CCC, CEMC, CFPC, CGSC, CIMC, COBGC, COSC CCO Program Director, has over 13 years coding and auditing experience and holds many certifications through the AAPC and AHIMA. She is a National ICD-10 Trainer for AAPC and served as a representative for the Great Lakes Region on the AAPC’s 2013-2015 National Advisory Board. She offers extensive experience in centralized billing, family practice, cardiology, GI, mental health, anesthesia, and multi-specialty environments. She has worked as an adjunct college instructor in medical coding, a compliance auditor for one of the largest healthcare systems in Indiana, and as a Big 5 consultant. She is currently an independent consultant and enjoys teaching and finding ways to simplify the world of coding accuracy and education. how about a case of multiple sclerosis with osteoporosis, how do I code for the lateratity?